St. Laurent Boulevard, also known as The Main, is an iconic Montreal thoroughfare peppered with shopping opportunities along its 11-kilometer stretch. Mind you, the stretch isn't quite as commercially dense as downtown Montreal's Ste. Catherine Street save for a few days a year during sidewalk sale season, when the Main really comes alive. St. Laurent street fairs, sidewalk sales, or ventes trottoirs as they're called in Quebec, usually feature clearance sale prices on apparel, housewares, and accessories. But they're not just about sales. Ironically, sales are often the last thing on some people's minds. Street fairs and sidewalk sales tend to attract every walk of life, including the shopping-averse. Locals and visitors get street massages. They visit indoor and outdoor art exhibits. They linger on terraces with a cold brewski, cocktail, or glass of wine, deciding which morsel of street food they'll try next. Mangoes-on-a-stick and fried noodles are de rigueur, Main street fair traditions, and if your timing is right, live entertainment, from DJ sessions to other surprises inevitably occur at the most vibrant street fair in the city. Recent years have seen the addition of live mural art creation along St. Laurent and nearby nooks courtesy of Mural, a public arts festival attracting international talent woven into the annual street fair experience since its inception in 2013, furnishing the urban landscape with stunning murals, some of the most impressive spray-painted art in the modern world. Mural (different than Mural Public Art Festival) has not announced 2019 dates yet. Check the website for updated information. St. Laurent Boulevard, from Sherbrooke to de Pins, is always closed off to traffic during street fairs but street closures can extend all the way north at Mont-Royal (map). It really depends on the edition. In years past, Mural extended from Sherbrooke to Avenue Mont-Royal. 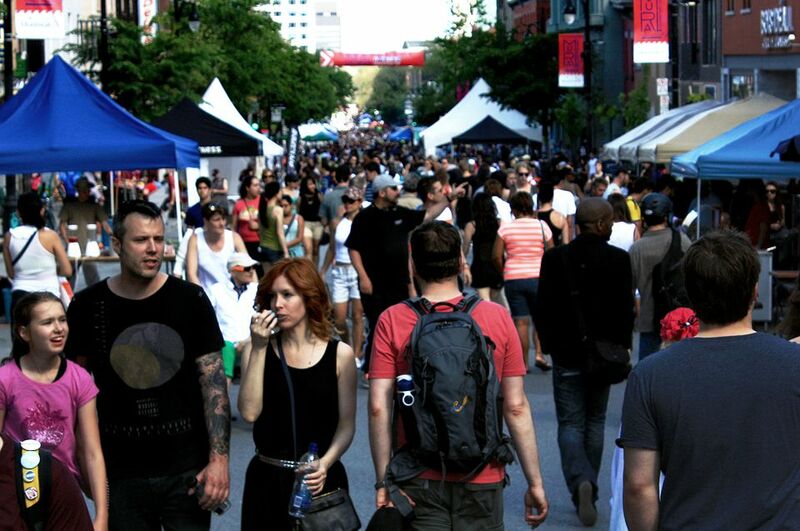 The easiest way to get to the festival is via the Sherbrooke Metro, St. Laurent Metro, or even Mont-Royal Metro, which all lead to the Main's street fests. You can also drive and park yourself, but expect to pay a fee for garages. Further north, notably in June and in August you'll find Little Italy's Formula 1 street fair and Italian Week festivities among more local farmer's markets and crafts fairs that pop up on summer weekends.